The beautiful city of Geneva wowed my family with the sparkling waters of its lake and the orderly elegance of its public spaces. The appeal of this child-friendly town, however, goes beyond its city limits. Geneva sits surrounded by wonderful Alpine peaks and is an ideal base for day trips to discover the surrounding countryside. 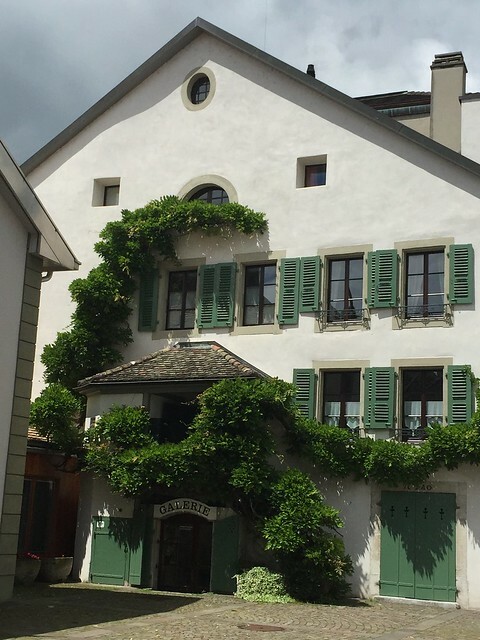 On our second day in the city, we made the most of this geographical location and opted for a kid-friendly day trip to the nearby village of Nyon. Nyon is located about 25 km North East of Geneva, along the shores of Lac Leman. Since the 1970s, it has been considered part of the metropolitan area of Geneva but it retains very much the charm of a small Swiss village, thanks to its pedestrianised streets meandering around a whitewashed medieval castle. It is an easy and very pleasant kid-friendly day trip from Geneva and one I recommend in all seasons: as we discovered at our own expenses, the weather here changes fast but the town is fully equipped for all eventualities! Nyon is easy to reach from Geneva: from the main Gare Cornavin (Geneva’s city centre station) there are frequent commuter trains, providing a reliable and user-friendly service that connects the two centres in a little over 15 minutes. We caught a late morning train and the kids had the first surprise of the day: the train had two storeys and we were able to secure a panoramic seat on the top one! Transport is key when travelling with children and this was a good start. We got to Nyon during the weekend of the fete de la musiques (the local music festival) so the town was wearing its celebration clothes: stalls, live bands and street performers filled the place with cheer and the delightful smell of BBQs! The town of Nyon dates back to Roman times: it was originally built by Julius Ceasar, who dominated this area, and its latin name was Noviodonum. It was the urban centre of the important Colonia Julia Equestris, one of Switzerland’s most important Roman sites, built around 45 b.C, just one year before the killing of her founder. Its main landmark, however, dates back to the Middle Ages: an imposing castle, with white towers and pointy roofs, overlooks the city with understated elegance. If reaching the castle from the train station, the first space you will encounter is a beautiful and lovely town square. It is a vision that seems to have popped out of mittle-European fairy tale books. Small houses with colourful flowers on the windowsills, wooden shutters, a fountain of fresh water spilling in the centre of the square: everything here talks about a slow pace, tranquil city life and invites you to take your time to take it the small architectural details that make the town so pretty. The walk across Nyon is pleasant and easy, and the first impression you get about the city is of a place built on flat grounds. Once you cross the imposing castle gates, however, you realise your mistake. Rather than lying on the lake shores, Nyon develops around the hilltop position of the castle: this made for a secure lookout and for a beautiful terrace with views over the lake and the mountains across. The castle is nowadays a museum hosting art exhibition but, unfortunately, we were not able to visit: the kids demanded to explore the castle grounds and their paths meandering downs towards the lake and what the kids demand, the kids often get! So after a stop in a good Italian restaurant just on the main square, we climbed don the hill towards the lake shores, beckoning from afar. Today we visited Nyon, a cute medieval town on #genevalake with a beautiful castle and equally beautiful view. The fluffy white clouds quickly turned grey and we had to run from pouring rain: the kids thought the mad run for cover was hilarious, I was slightly less impressed ? Our morning in Nyon was blessed by beautiful sunshine, but by the time we had finished our lunch dark clouds had gathered above us and soon we found ourselves in pouring rain. Our original idea for the day was to catch a boat from Nyon and also see the castle in Yvoire, a town nearby, but the thick fog quickly made us change plans. Thankfully we discovered that Nyon is well equipped for the rain: it has not one but 4 very interesting museums, all family friendly and all accessible through just one ticket allowing you entrance to all city museums for the whole year! We only had the time to visit one and what we saw we loved: the museum of Lac Leman as a hit with the kids and a fun and informative stops. The Musee du Lac Leman is devoted to explaining to visitors life in and around the lake: it has some interesting water tanks with local fish and a large area devoted to water safety and rescue systems. When we visited it also had a temporary exhibition about hunting which my kids loved because it had several specimens of stuffed ducks! I don’t know what it is with kids and stuffed animals, but after visiting Dublin’s dead zoo and seeing their smiley faces nothing surprises me anymore. The museum is very well equipped for kids: first of all, little explorers go free, which is a nice touch. Secondly, on entering the museum you have activity sheets divided by age that help the kids engage with the exhibits around them. Finally, the museum is interactive and invites the kids to experience the artefacts hands on. A small cafeteria with self-service coffee and water is also a lovely touch and the bathrooms are perfect for families, being spacious and equipped with baby changing facilities. As if this wasn’t enough to make the museum child-friendly, just outside of it there is a lovely, safe playground that my kids soon spotted: an enclosed space nestled between the museum and the lake, it has toys for kids of several ages and covered seats for parents to rest. We experienced the playground in the rain and it was a great hit: in the sun, I would expect it would be hard to peel the kids away! Our day in Nyon soon came to an end, but had we been staying in the area for longer we would have no doubt come back. The tickets give access to three additional museums, including one devoted to the roman history of Nyon and the castle, and considering how child-friendly the one about the lake was, I have no doubts they would be a great family visit too. The train soon brought us back to Geneva. With the eyes filled with Nyon’s beautiful lake and castle. the kids and I started to get ready to return to Dublin. Our early morning Swissair flight didn’t leave us nought time to visit all we wanted around the lake but makes us confident of our ability to come back to these beautiful mountains soon. if you are looking for additional ideas of wonderful towns and areas to visit in Switzerland, you can also have a look here (Lucerne) and here (Rapperswil), where you wil find articles by I am Voyager, fellow travel blogger and excellent travel writer. Did you enjoy this post? Follow me on pinterest for more family travel ideas!